Seafloor Planner is specifically designed for planning and optimizing ocean bottom node and ocean bottom cable surveys. Based on the same technology that our flagship product survOPT is so well known for, Seafloor Planner lets you instantly see the estimated completion time, vessel utilisation figures, critical path and other useful information about your ocean bottom seismic survey. 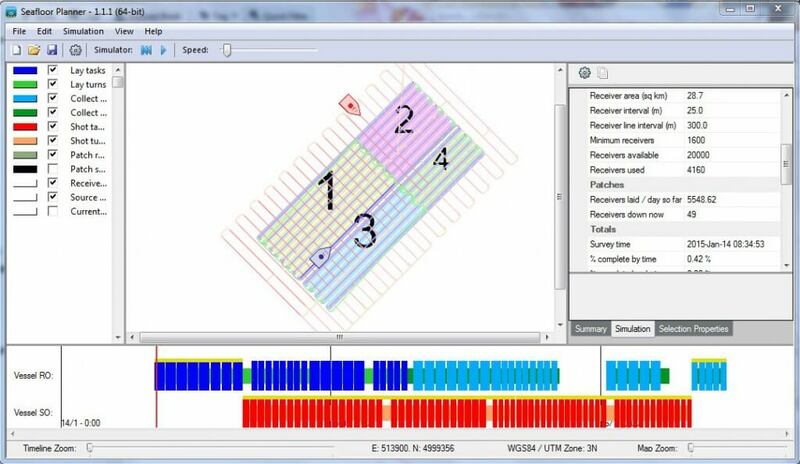 Run simulations to compare different line spacing, different turn patterns, wider patches or more receivers. Find out which tasks are on the critical path and how they can be done faster. Seafloor Planner lets you compare different scenarios for these and many other factors and visualise immediately how these affect your ocean bottom node or ocean bottom cable survey duration. Check What’s New to read about Seafloor Planner’s latest features.